• The Spanish Surrealist went from a penniless painter to the toast of the NYC art world in one single canvas, “The Persistence of Memory”. It so happened that Salvador Dali was thrown out of his house when he was 25-year old. It was a struggle period for the painter as even though he was a part of the surrealistic movement, he had yet to find decent patronage among dealers. Dali was out casted from the community because of being outlawed by his father under the shade of his influence. This came off as a hardship to him since he was debarred from his major source of inspiration. Finally, the painting “The Persistence of Memory” made him world famous at the age of 28. • He introduced the image of melting watches which epitomes his theory of “hardness” and “softness” which was central to his thinking at the time. The persistence of memory is not easy to grasp. It has been interpreted in many ways by several art scholars. Some of them said that the painting is influenced by Sigmund Freud’s work of psychoanalysis and sub consciousness, since Dali was very fond of the latter. Since dream is a concept very integral in understanding “Surrealism’ and “Sub Consciousness”. Later, Freud reciprocated Dali’s admiration saying, “I’ve always viewed surrealists as fools but this Spanish Young Man with fanatic eyes of a Genius made me reconsider that opinion”. • On the other hand, some other art scholars believed that Dali got his inspiration from Albert Einstein’s ground breaking theory of General Relativity of space and time as in reference to the melting watches and depicting time as a flexible element. Although, later the painter having denied that, gave a better insight about dreams and their passage of time. Take for instance- waking up in a dream and hoping to be in some different time frame. 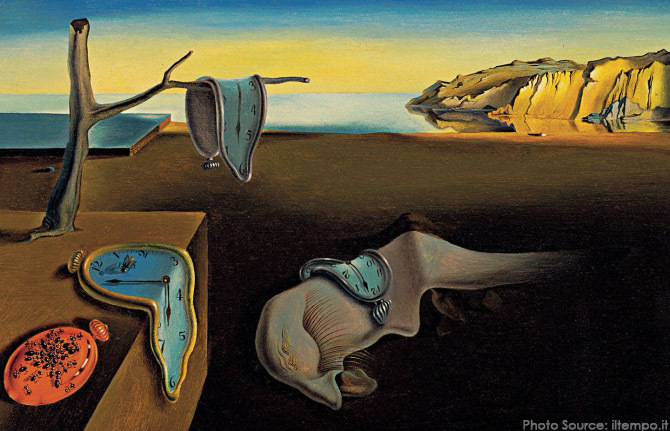 Through these melting clocks, Salvador Dali might be suggesting us that the old fashioned frame of time is being washed away in this post- modern era. • The painting is sort of debated to be a self- portrait. The central character of the painting depiction is supposed to be symbolically representing Dali. The quirky and unusual shape and the closed eyelids represent fantasy and inner world. It is likely that Dali himself recognized and developed the different shades of historical, artistic, social and autobiographical meaning encrypted into his art work. And moreover, since Dali had used his self portrait in other of his paintings, the “fading” creature may have been used to represent him. • The Painting was created amidst a hallucination or to put it as “Irrational Knowledge”. Above all the surrealists and their achievements, stands Dali’s “Paranoiac Critical Method”. The artists used to go in a trance state of meditative self- induced psychotic hallucinations so that he could make his “dream” paintings. • The painting was first shown in Paris at Galerie Pierre Colle in 1931, preceeding which it was also showcased at the first surrealist exhibition in the United Sattes, at the Wadsworth Athenaeum, Hartford, Connecticut. After that in 1934, the painting was exhibited by Julien Levy in New York. • In 1934, Dali and his Wife Gala accompanied the painting over to New York travelling in third class with the financial assistance of Pablo Picasso. • It was ironic in nature that the painting symbolized decay through its melting clocks but acted as an ascent for the career of Spanish Surrealist. • By this time, Dali was no more a formal Surrealist somewhat due to his difference of political opinion. Even though by that time, Dali became one of the greatest surrealist painter in the world but he had a hard time with the fellow surrealists. Dali later declared at his ousting,” I myself am surrealism”. • The dream and sub consciousness play a pivotal role in the surrealistic art but sarcasm, dark humour, joke and word play are also equally important. And thus in the very title of the painting, Dali uses his word play. According to the title of the painting, “The persistence of memory”, it is supposed to give a view of long etched memory in time but the painting depiction signifies otherwise when we take into account the melting clocks. The clocks literally melting and the red clock decaying seem anything to be true but “persistent”. Thus a darker word play has been used here therefore. • The painting and a kind of sequel, “The Disintegration of the Persistence of Memory”. It shows “Persistence of Memory”, broken into smaller fragments, each a series of rectangular blocks which reveals further imagery through gaps between them. Alternatively, the painting is also known as “The chromosomes of a Highly Coloured Fish’s eye Starting the harmonious Disintegration of the Persistence of Memory”. And moreover, between these two paintings Dali’s personal obsessions shifted. The differences between the two paintings signify the SHIFTS THAT TOOK PLACE IN Dali’s life in between this time period. • The cliffs that provide the background are taken from images of Catalonia, Dali’s home and the shadow of his summer house in the shade of Mount Pani dominates the foreground. Thus on a whole, there is an imbibed relic of Dali’s childhood in the painting. • The painting occupies a reference in the Pop culture. Television shows such as Matt Groening’s Popular The Simpsons, Futurama, Hey Arnold, Doctor Who, and Sesame Street have used its references. Similarly it has been eluded in the movie, Looney Tunes: Back in Action, in the popular comic strip “The Far Side” and in videogames like “Earthbound” and “Crash Bandicoot 2: N Tranced.